Pluto’s frozen nitrogen custard “heart” has certainly received its share of attention. Dozens of wide and close-up photos homing on this fascinating region rimmed by mountains and badlands have been relayed back to Earth by NASA’s New Horizons probe after last July’s flyby. For being only 1,473 miles (2,370 km) in diameter, Pluto displays an incredible diversity of landscapes. This week, the New Horizons team shifted its focus northward, re-releasing an enhanced color image of the north polar area that was originally part of a high-resolution full-disk photograph of Pluto. Inside of the widest canyon, you can trace the sinuous outline of a narrower valley similar in outward appearance to the Moon’s Alpine Valley, cut by a narrow, curvy rill that once served as a conduit for lava. We see multiple canyons in Pluto’s polar region, their walls broken and degraded compared to canyons seen elsewhere on the planet. Signs that they may be older and made of weaker materials and likely formed in ancient times when Pluto was more tectonically active. Perhaps they’re related to that long-ago dance between Pluto and its largest moon Charon as the two transitioned into their current tidally-locked embrace. In the lower right corner of the image, check out those funky-shaped pits that resemble the melting outlines of boot prints in the snow. They reach 45 miles (70 km) across and 2.5 miles (4 km) deep and may indicate locations where subsurface ice has melted or sublimated (vaporized) from below, causing the ground to collapse. Notice the variation in color across the landscape from yellow-orange to pale blue. High elevations show up in a distinctive yellow, not seen elsewhere on Pluto, with lower elevations and latitudes a bluish gray. New Horizons’ infrared measurements show abundant methane ice across the Lowell Region, with relatively little nitrogen ice. The yellow terrains may be older methane deposits that have been more processed by solar UV light than the bluer terrain. The color variations are especially striking in the area of the collapse pits. 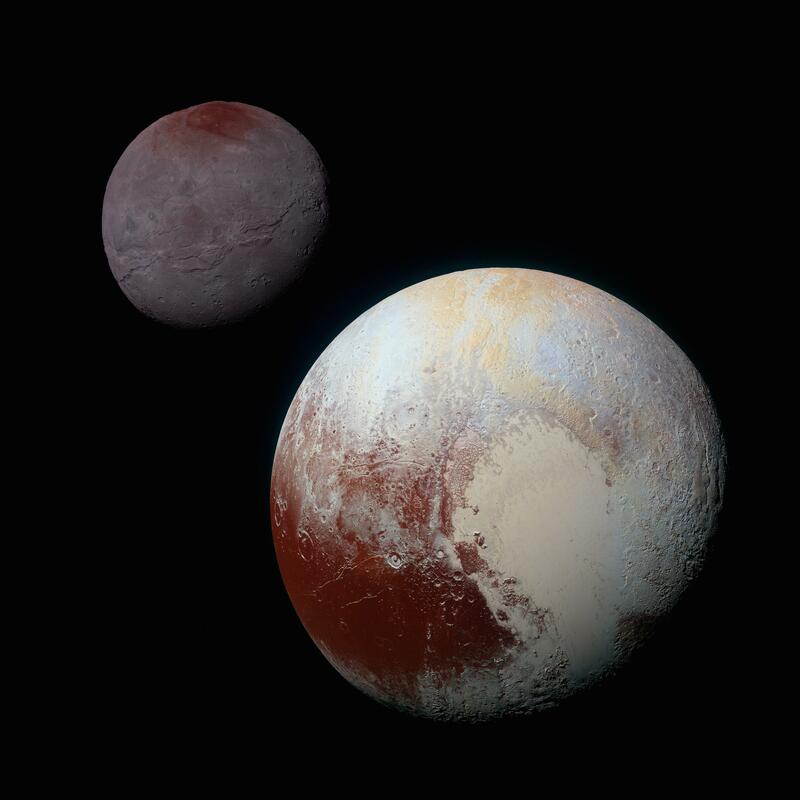 Pluto’s icy riches include not only methane and nitrogen but also water, which forms the planet’s bedrock. NASA poetically refers to the water ice as “the canvas on which (Pluto’s) more volatile ices paint their seasonally changing patterns”. Recent images made in infrared light shows little or no water ice in the informally named places called Sputnik Planum (the left or western region of Pluto’s “heart”) and Lowell Regio. This indicates that at least in these regions, Pluto’s bedrock remains well hidden beneath a thick blanket of other ices such as methane, nitrogen and carbon monoxide. To delve more deeply into Pluto, visit the NASA’s photojournal archive, where you’ll find 130 photos (and counting!) of the dwarf planet and its satellites. There’s a “Chuck Norris fact” that says Chuck once went skydiving but promised never to do it again, saying one Grand Canyon is enough. But Chuck must have taken another jump millions of years ago. Data gathered by NASA’s Operation IceBridge, an aerial science observation mission, has uncovered a previously unknown massive canyon in Greenland, hidden under a kilometer of ice. The canyon, found by airborne radar data, has the same characteristics of a winding river channel like the Grand Canyon in Arizona. It is at least 750 kilometers (460 miles) long, making it longer than the Grand Canyon. In some places, it is as deep as 800 meters (2,600 feet), on scale with parts of the Grand Canyon. This immense feature is thought to predate the ice sheet that has covered Greenland for the last few million years. While additional airborne radar data was used, the majority of the data was collected by IceBridge flights over Greenland during flights from 2009 to 2013. IceBridge’s Multichannel Coherent Radar Depth Sounder can see through vast layers of ice to measure its thickness and the shape of bedrock below. In their analysis of the radar data, Bamber and his team discovered a continuous bedrock canyon that extends from almost the center of the island and ends beneath the Petermann Glacier fjord in northern Greenland. At certain frequencies, radio waves can travel through the ice and bounce off the bedrock underneath. The amount of time the radio waves took to bounce back helped researchers determine the depth of the canyon. The longer it took, the deeper the bedrock feature. The researchers believe the canyon plays an important role in transporting sub-glacial meltwater from the interior of Greenland to the edge of the ice sheet into the ocean. Evidence suggests that before the presence of the ice sheet, as much as 4 million years ago, water flowed in the canyon from the interior to the coast and was a major river system. Bamber and his team had their findings published in the journal Science.